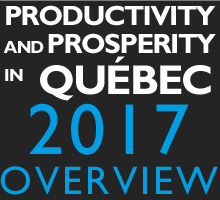 Montréal, September 20, 2017 – Every year, the Quebec government collects large amounts of revenue from businesses through their contributions to the Health Services Fund (HSF). Better known as payroll tax, this fiscal tool is often seen as an effective means of ensuring that businesses contribute to the province’s tax system. While this finding is troubling, given the already hefty tax burden on Quebec workers, this transfer could have especially negative consequences. Unlike personal income tax, where rates rise in line with income growth, there is no mechanism to ensure that HSF contributions respect the principle of progressive taxation. Thus the least mobile workers, those who lack qualifications or experience, may be harder hit. © Centre for Productivity and Prosperity Walter J. Somers Foundation, 2016. All rights reserved.